At 16 years old, Erick Castillon was depressed and dismayed with his low academic performance at Alamo Heights High School. A final attempt by his school counselor led him to Mr. Colin Lang’s class. Rocketry, it seemed, would become Castillon’s redemption. When he walked into Mr. Lang’s rocket-lined classroom, Castillon said he felt an immediate change of heart. While not entirely eager to stay in school, he was eager to get his hands on some rockets and get those rockets in the air. And go higher he did. Castillon channeled his frustration into rockets, but, eventually, those rockets carried a new traction of hope and aspiration. 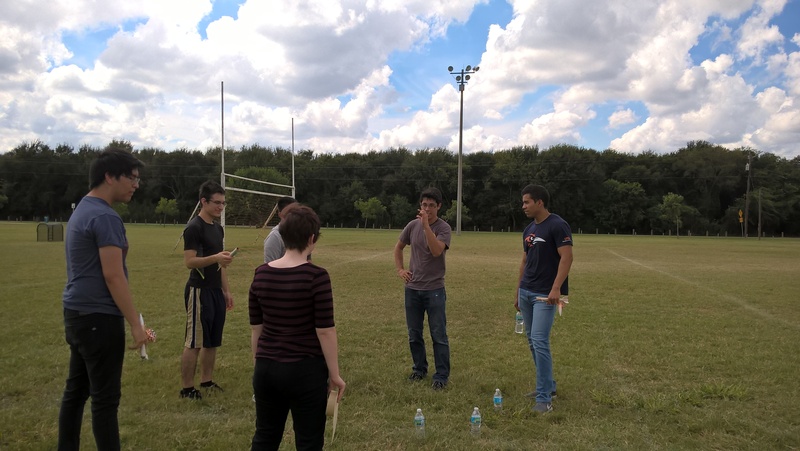 UTSA’s new Aeronautics and Rocketry Club (ARC) is the brainchild of Castillon. The organization unofficially began in fall 2015, but Castillon, the group’s founder, left school to take his second internship with NASA; his first internship was for nuclear propulsion while the second was for the current Mars Rocket Space Launch System (SLS). Upon his return during the summer 2016 semester, Castillon finalized ARC’s status as an official UTSA club, and he sought to gain more members by a very risky and unusual tactic. He brought one of his rockets to campus as a sort of promotional piece—it was 11-feet long. Castillon noted that one specific thing contributed to the spark that ignited his interest in the club: the application of STEM inherent in rocketry science. ARC’s mission statement asserts that the club “aims to expose UTSA to the rewarding science of rocketry” and “to teach students and its members valuable work experience and skills through real-world applications.” These two components are based on Castillon’s personal experiences. “The application really helped me see what science and math can do,” he said. Furthermore, Castillon expressed concern on the fleeting focus of rocketry and aeronautics in American education and culture. During the Apollo program of the 1960s, application was everywhere. “You had eight-year-old kids going to school and flying rockets,” said Castillon. “They were doing something fun to incorporate math and science. According to the 2015 Degrees Awarded Fact Book from the UTSA Office of Institutional Research, only eight percent of UTSA graduates received degrees from the College of Engineering, with 331 students earning the bachelor’s degree from an engineering field. UTSA does offer an Aerospace Studies minor within the Air Force Reserve Officer Training Corps program. Texas A&M University and the University of Texas each have their own well-established Aerospace Engineering programs. UT in particular boasts a wide array of astronaut alumni including Alan Bean, the fourth man to walk on the moon. With SpaceX in Brownsville, NASA in Houston and Boeing and Lockheed Martin around the San Antonio area, Castillon feels like UTSA and Alamo City are ripe to seize opportunities within the aerospace field. The Aero-Engines Americas Conference comes to San Antonio in February 2017, suggesting others have noticed San Antonio’s potential. Castillon intends for the club to create a UTSA collection of rockets for the university’s own use, capable of launching a payload from 1-50 lbs. at an altitude of one mile. Three launches were planned for this semester, the first having occurred about a month ago. The second will be during the first week of November, with a goal to reach 1,000 ft. using a small Estes engine. ARC’s final launch for the semester is anticipated to reach half a mile up. Students will design their own rockets and have their projects heavily checked and reviewed by the Critical Design Review Process—a standard by which Mr. Lang evaluated the work of his high school students and by which Castillon will now scrutinize the ARC rockets. ARC has no budget. They operate strictly off donations from sponsors including Southwest Research Institute, which provided materials for ARC to build their first generation of rockets. Community outreach, particularly geared toward young space oddities, is a longterm focus for the club. With his humble beginnings continuously influencing his vision, UTSA’s own rocket man emphasized the desire to share what has been shared with him: to find someone looking down and challenge them to look up to the stars.